With a production run of more than 20 years and over 6,600 boats produced, the Catalina 27 surely ranks as the most popular cruising sailboat built to date. Like Cal Ripken’s consecutive game streak or the transatlantic crossing record, this record will also likely be broken again someday but it’s hard to imagine when. Production of the Catalina 27 began in 1970, and by 1975 over 2,000 27s had been built. Early models were available with outboard power only. However, in 1973, Catalina began to offer an inboard Atomic 4 engine as an option. A variety of inboard engine options were available over the years. Catalina continued to offer an outboard option until 1989. In 1991, Catalina discontinued production of the 27 and replaced it with a completely redesigned boat; the Catalina 270. Design credit for the Catalina 27 goes to Frank Butler and Robert Finch. Designers don’t always get it right the first time but Finch and Butler did on this one, and the principal dimensions remained unchanged throughout its production run. 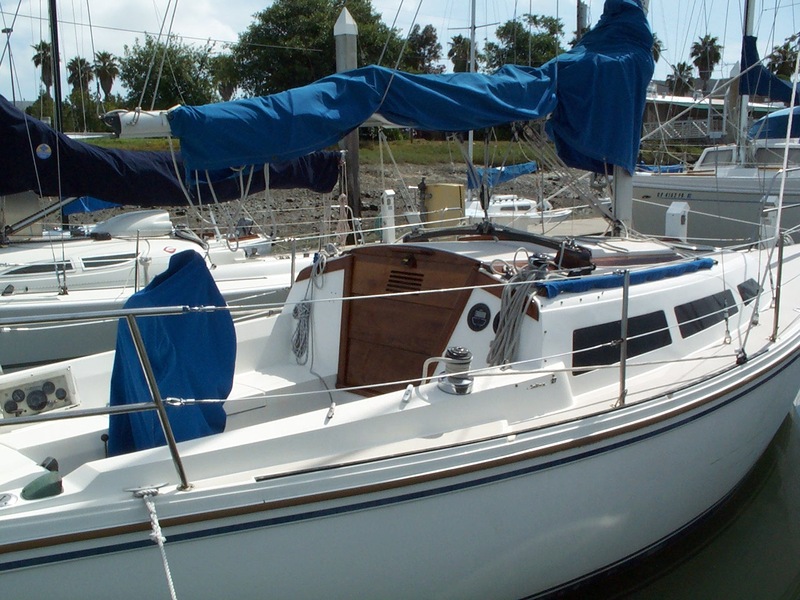 In 1979, Catalina began offering a shoal draft wing keel version with a draft of 3’5" rather than the standard 4’. For those interested in a bit more performance, a taller rig was later offered that increased the aspect ratio of the main and increased total sail area by some 24 square feet. Literature from 1974 calls the boat a Catalina 27 (1/2 ton). This specifies an IOR MK rating of 21.6’. This is the only reference I’ve ever seen to the Catalina 27 as an IOR racer. No doubt she could not compete against the other mid 70s 1/2 tonners which were generally around 30’ LOA and 25’ on the waterline. General sailing performance of the Catalina 27 is a bit difficult to evaluate due to the number of keel, rig and engine options offered. For these same reasons, the boat was never much of a success as a one-design racer either (although the Annapolis-based C-27 fleet continues to thrive). However, many boats are found to be competitive in various PHRF fleets. Typically under PHRF rules, the Catalina 27 rates between 201 and 216--slightly faster than other contemporary 27-footers such as the O’Day, Hunter and Ericson. The deep draft/tall rig combo is said to be the fastest configuration. A recent PHRF of the Chesapeake listing shows 23 27s currently racing on the Bay with six different configurations. Each engine, rig and keel combination performs slightly differently. In general, the Catalina 27 has a reputation as a well-mannered lady with decent speed for daysailing and friendly competition between piers. Demand for Catalina 27s in good condition remains strong among first time buyers and sailors moving up to their first cruising boats. Even by today’s standards, these boats are quite roomy for a 27-footer. The designers provided this room and decent cruising accommodations in a package that remains good looking and "yacht-like" to most sailors’ eyes. The Catalina 27 is not, nor was it ever intended to be, an around-the-world cruiser. Construction tends to be on the light side. The solid fiberglass lay-up of the hull is not overbuilt, particularly above the waterline and may fracture from impacts that would leave a heavier built boat with only a scratch. Early boats lacked proper backing plates on hardware, through-hull fittings were poorly installed, and secondary bondings of attachments in some cases were poor. Leaking chain plates have caused the bulkheads, to which they are attached, to deteriorate raising the possibility of rig failures. Fuel tank installations were poor on early inboard models. With more than 6,600 produced, there are plenty of Catalina 27s around. If you do your sailing on protected or near-shore waters and you’re in the market for a moderately sized, moderately priced cruiser, be sure to keep the Catalina 27 on your short list.